Kullu, a popular tourist destination generally coupled with Manali, is an open valley with panoramic views and majestic hills covered with Deodar and Pine trees. Situated at an altitude of 1230 meters, Kullu is a nature lover's paradise. Abundant with lush greenery, pristine river streams and a wonderful climate, Kullu is known as one of the most popular tourist spots in Himachal Pradesh. 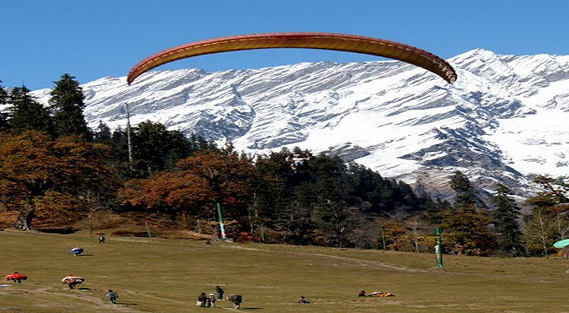 Kullu is also popular as a sister town to Manali which is on much higher altitude and provides more scenic views. Typically travellers cover both Kullu and Manali in one trip. Tourists coming to Kullu and Manali can indulge in a lot of adventure sports activities like river rafting, trekking, mountaineering etc. Set in the lap of nature, the picturesque landscape of this small town is mesmerizing. Kullu also has few important temples like the Raghunath Temple and Jagannathi Devi Temple. Apart from temples, the Pandoh Dam and Chandrakhani Pass are also must-visits in this region. Kullu is also used as the base town to reachÊManikaran, Kasol, Malana, Bhunter and Rohtang Pass too. Malana is an ancient solitary village in Himachal Pradesh in an isolated and charming plateau by the side of the Malana River. Known as Malana Nala, it lies in Parvati Valley which is a quaint corner away from rest of the world. One of the unique aspects of this destination is the strong culture and beliefs of the locals, who follow their rules with the utmost tenacity. According to them, Malana is the place where democracy is best followed with the well-organized parliamentary system, guided by their deity Jamlu Rishi. It is believed that Jamlu was worshipped during the pre-Aryan times. It has been the subject of various documentaries like Malana: Globalization of a Himalayan Village and Malana, A Lost Identity. Their court system resembles The Ancient Greek System as they believe themselves to be the followers of Alexander the Great. Not only is the culture of Malana unifying, the team spirit of the place is reflected in its houses as well. Set in the verdant valleys of Himachal, the houses in Malana are either two or three-storied and have specific names and purpose assigned to them. Built out of stove and limber, the outer side of the house is built with wood. The ground floor or Khudang is for the safekeeping of the cattle and acts as a storage for firewood and fodder. The first-floor called Gaying is for storing eatables, wool and weaving woollen fabric. The top floor Pati and is the living quarter. Malana is most famous for its production of Hashish, which is hailed as the best in the region. Great Himalayan National Park, situated in Himachal Pradesh is spread over an area of 754 square kilometres at an altitude of between 1500 to 6000 m. This UNESCO World Heritage Site was established in 1984 and has four valleys named Sainj Valley, Tirthan Valley, Jiwa Nal Valley and Parvati Valley. They are all famous for their natural and scenic beauty. The Great Himalayan National Park is one of India's national parks, which is located in Kullu region of Himachal Pradesh. This beautiful location of the national park becomes all the more attractive due to the Deodar and Oak trees. Surrounded on all the three sides by the Himalayan Mountains, the park is home to diverse wildlife species. The Great Himalayan National Par received the status of a national park in 1999. At present, it is home to more than 375 species of fauna, 31 species of mammals and 181 species of birds. The secluded location of the park has made sure that the villages inside the park have a culture of their own. Every village inside the inside has a deity of its own. There are also some fairs organized here during April, May, August, and September. The National Park is an amazing place to relax and unwind at away from the fast life of the city. It is a must-visit for all the nature lovers out there. One of the trekkable summits in the Indian Himalayan region, the Friendship peak looming at an elevation of 5,289 meters in the Pir Panjal range in Himachal Pradesh is a trekker's heaven. From the summit, one can feast his eyes on the panoramic view of the Pir Panjal range and on the vicinity which is crowned with silver horizon formed by the Dhauladhar and Great Himalayan ranges.The journey passes through the beautiful Solang valley that houses several alpine meadows, thick forest dotted with varied species of alpine trees, colourful orchards and crisscrossed by numerous small and gushing streams. Moreover, the journey drives you crazy once you reach a certain altitude, with steep climbs over the thick bed of snow and walking over glaciated tracks and narrow ridges. Regarded as one of the most challenging treks in the northern Himalayan region, Parvati Valley Base Camp Trek is perfect for those seeking adventure. The mesmerising views all around will not only leave you spellbound by its beauty but also filled with adrenaline by the challenges it throws at you at every nook and corner. Although the trail is not really well laid, the thrill it brings is unmatched to any other trek. Although the trek is quite long and taxing, the reward is extremely exhilarating. As the altitude increases, the surroundings become more enchanting adorned with dense forests, lush green meadows and a plethora of gushing streams, all being flanked by majestic snow clad peaks. The peaks with changing colours are quite unique and the sun gleaming over them makes the surrounding all the more beautiful. Crossing the Parvati River and its various tributaries can be a bit excruciating and so does traversing the high altitude fissures. However, no matter what number of challenges it presents, the overall trek is exhilarating enough to make it one of the most sought after Himalayan Pass trek at high altitudes. A blazing blue Brighu Lake sits snug between two high-altitude ridges towards the east of Rohtang Pass. One of the many glacial lakes in Kullu Valley, this lake makes for a perfect weekend trek and is also well- suited for families. The remarkable thing about this trek is that one can reach an impressive altitude of 14,000 feet and experience snow over the second day of trekking! To add to that, the camping grounds at Rola Kholi and Pandu Ropa offer dream-like views to wake up to. Manikaran is a small town situated between rivers Parvati and Bears, famous for its hot water springs and beautiful landscapes. The town has many temples and a gurudwara, making it a significant pilgrimage centre for Hindus and Sikhs alike. Like any other sacred shrine or temple in the area, this one too finds itself a picture perfect backdrop. Watching over valleys from the top of a hill, the temple dedicated to Hindu Goddess Mata Hanogi, has a stream running down below, creating the perfect scenery for a religious and sacred structure. One can also enjoy trekking and rock climbing nearby. What could be a better shopping spot than the hill station markets which provide you with a mix of traditional and modern stuff? It has pashmina shawls, Tibetan traditional stuff, Buddhist paintings and many other wooden stuff. Shopping here is an absolute delight. After a beautiful day of sightseeing, the best option is to shop. Extravagant things in Kullu Market are Kinnauri and Kullu Shawls which are entirely different from the traditional Kashmere flower design. However, these shawls have Asian inspired geometrical designs. Nepalese Thangka is tough to find outside the Kullu valley. It is a 3D effect traditional Buddhist painting of either a Tibetan deity or of some spiritual concept. Tibetan Silver Jewellery is intricately carved and heavy Tibetan jewelry is very easily found here. Amulets, neckpieces, earrings are all inspired by the Tibetan traditional beliefs and motifs i.e. to ward off the evil eye. Kullu Caps are made of pure pashmina and angora wool. The caps reflect the aesthetics and excellent skills of the artisans of Kullu. Kullu is a popular destination for those in search of a trek through mountains, valleys, streams and more. The treks here are usually at a high altitude, cover various terrains, some welcoming and some not so much, as well as some unexplored landscapes and sacred temples. One can have treks in and around the area of a duration of 10-12 days to 2-3 weeks. For something which demands lesser time, one can try out the Putasar Lake trek which takes about 4 days to complete. April to June and then September to October are the months when you can make the most of you trekking experience in Kullu. Thousands of pilgrims come here every year to pay homage to Lord Shringa, who is the ruling deity of Banjar valley. The temple houses an idol of Shringa Rishi along with goddess Shanta in the temple. It is at small distance from the town of Kullu. What is generally overlooked as a town of utility only, with an airport and the last ATM before you travel to higher altitudes, is a town where one can have a calm, simple and almost idle break from the popular Himachal hill stations and their tourist rush. Surrounded by lush greenery, this town has a few sacred temples on can visit. Adventure-seekers can also go for white water rafting in the River Beas which flows near Bhuntar. Bhabha Pass trek combines the green of Kinnaur and the barren high altitude desert of the Spiti Valley. The trek starts from Kafnu situated in the Kinnaur Valley and passes through the lush green meadows and grazing fields on the banks of river Bhabha. As we cross over Bhabha and enter the picturesque Pin Valley, we witness the spectacular contrast in the mountains and a stark difference in the culture and tradition. The temple is surrounded by an ancient legend of a shepherd boy who caught hold of one of the two girls dancing to the tune of his flute. She then revealed that she was a goddess and decided to settle in that village. Built 1500 years ago, the Jagannathi Devi Temple is dedicated to Goddess Bhuwaneshwari, the sister of Lord Vishnu. The architecture of this temple is influenced by the Pahari style and its walls are artistically crafted with the images of Goddess Durga.